Brimming with protein, overflowing with potassium, filled with fiber—you won’t believe it, but each bowlful makes your RealAge by 11.4 days younger. Heat a medium saucepan over medium heat. Add quinoa; cook 4 minutes or until fragrant and lightly toasted, stirring frequently. Add water and salt; bring to a simmer. Simmer uncovered 15 minutes or until thickened, stirring occasionally. Meanwhile, cut prunes into bite-sized pieces. In a small saucepan, combine prunes, grape juice and, if desired, cinnamon stick. Bring to a simmer over high heat. Reduce heat; simmer uncovered 4 to 5 minutes or until prunes are soft and sauce has thickened, stirring occasionally. Remove cinnamon stick if using. 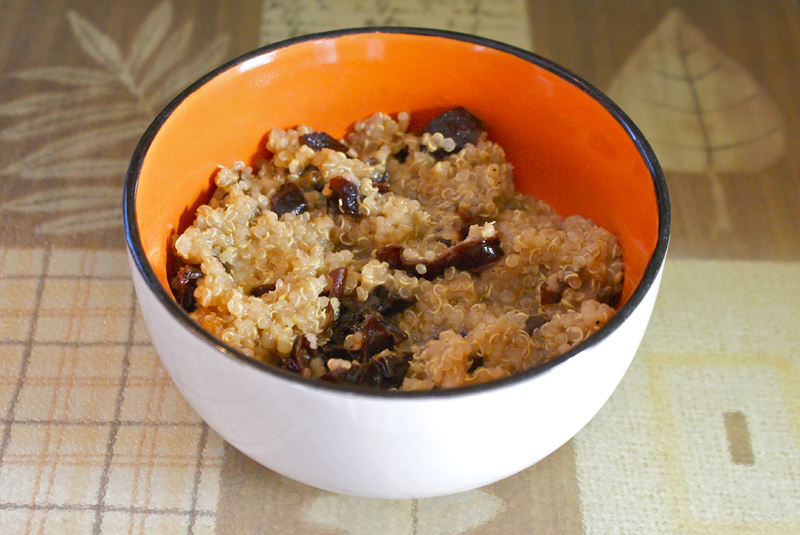 Transfer quinoa to shallow serving bowls; top with warm prune mixture and yogurt. *Quinoa (pronounced keen wa) is a weed of the high Andes that is high in protein and minerals. For all practical purposes, it is treated as a grain Toasting quinoa adds nuttiness and crunch. Expect the husks to pop up like a dust storm when you pour the grain in the pan-they’ll just float away. Mexican cinnamon also makes a difference here. Canela cinnamon is softer, richer, rounder and fruitier than the cinnamon sticks you find in spice bottles. Save the stick from this recipe, dry it out, and add it to a coffee grinder with three or four others—you’ll never go back to store bought cinnamon powder again. Wheatena cereal may replace the quinoa. Prepare the cereal according to package directions. Try to get the quinoa, just once—it makes a big difference.